You are now holding the second CD made by the Czech String Duo, which we recorded to celebrate the twenty-fifth anniversary of our shared artistic path and life’s journey. We began devoting ourselves to music for violin and cello while still studying at the Prague Conservatoire, and we are gradually expanding our repertoire to this day. The mainstays among the works originally composed for violin and cello are by composers of the Classical era and of the 20th century. There is something of a gap in our repertoire for the nineteenth century, when no important works were actually written for violin and cello, so we resort to arrangements when necessary. From the beginning, we were excited that our favourite composer Bohuslav Martinů wrote two beautiful duets for violin and cello. These two duets have accompanied us throughout our careers, and we have enjoyed success with them at concerts in our country and abroad. In 2002 we recorded them together with other works by great composers of the twentieth century, Ravel and Honegger, on our first CD. For our second CD, we have chosen a more classical programme. We selected compositions that we enjoy playing frequently at our concerts and that audiences applaud whether they are familiar or not. In the cases of the duets by Fiala, Stamitz, and Paganini, this may be their very first CD recordings. Our conception of the Passacaglia by Georg Friedrich Händel (1685–1759) is as the ceremonial opening composition for our CD, although it is usually played at the end of concerts or even as an encore. It is one of the most frequently performed works for our instrumentation. The virtuosic arrangement by the Norwegian composer and violinist Johann Halvorsen (1864–1935) was written for violin and viola, but we have the feeling that our version for violin and cello sounds even better thanks to the cello’s greater range. The passacaglia was originally a dance that developed during the Baroque era into a dance-like instrumental composition. This is basically a set of variations on an eight-bar bass line, and each variation is different in character, mood, and technique. It also offers performers the opportunity to realise even more ideas of their own, whether involving technique, tempo modifications, or sound. Although the work is widely known, one seldom hears two interpretations that are the same. Josef Fiala (1748–1816) was a typical versatile musician of the Classical period. He mastered the playing of several instruments, was active as a concert artist, and also composed. He was personally acquainted with Wolfgang Amadeus Mozart, who respected Fiala’s artistry and helped him get concert opportunities. The Duet in C Major is one of Fiala’s many chamber music compositions. The refreshingly virtuosic little work is filled with energy and optimism. 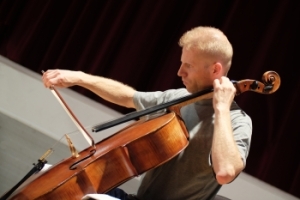 Because Fiala was also a cellist, contrary to tradition, the cello plays the leading role throughout almost the entire composition. Reinhold Glière (1875–1956), an Ukrainian composer of German-Polish origin, is not too well known even among musicians. Everyone is all the more pleasantly surprised by the witty Eight Pieces, Op. 39, for violin and cello. Dramaturgically, this may well be the most interesting work on our CD. Each of the eight pieces is different in character. Some are dance-like, others are dreamy; in some the melodic line of one voice is accompanied by the other, while in the others the two voices merge into a mutual dialogue. The individual pieces are not related to each other in any way, so they can be played individually. Interestingly, when Glière was learning to play violin at a music school in Kiev, he was a pupil of the Czech violinist Otakar Ševčík. The Duet in G Major, KV 423, by Wolfgang Amadeus Mozart (1756–1791) is a gem of our genre, although we are again playing it in an arrangement of our own, because the original was written for violin and viola. The viola part is far more independent and technically difficult than in Mozart’s other chamber music works. By using the entire range of the cello, the composition acquires yet another dimension and rises to the level of one of the greatest works of its genre. This duet has three movements like the duets by Fiala and Stamitz, but each is more thoroughly worked out with respect to both content and scope, making full use of the technical and expressive possibilities of both instruments. For this reason, the duet is one of our favourites. The word “virtuoso” is automatically connected with Paganini’s name. All of the works on our CD are more or less virtuosic, so of course Paganini could not be omitted. The Three Concertante Duets (Tre duetti concertanti) by Niccolò Paganini (1782–1840) are a rather rarely-heard example of his chamber music creations. In our recording, we are presenting the third of these duets. Paganini was surrounded by many myths and legends. It is certain that had he himself not been a brilliant violinist, he could not have written music that is still a tough nut to crack for today’s violin virtuosos. One could not, however, assert that the violin parts of these duets are virtuosic while the cello parts are mere accompaniment. To the contrary, in most places where the cello plays the lead voice, it is written in the violin register, so the cellist must play in truly high positions. Unusually, the duet has only two movements. The “Mannheim School” had a fundamental influence on the development of instrumental music during the Classical period and on the new manner of its interpretation. At the court in Mannheim, an outstanding orchestra was established, and a number of important Czech musicians worked there. The leading figure was Jan Václav Stamic. His elder son Karl Stamitz (1746–1801) was born in Mannheim and followed in his father’s footsteps. He gained Europe-wide fame as a violinist and composer. His works consist mainly of chamber music and concertante compositions for string and wind instruments. For our CD, we have chosen the first of his Six Duets, Op. 19, for violin and cello, which is a typical example of his music and of the newly established compositional style of the Classical period. The Humoresque by Antonín Dvořák (1841–1904) perhaps needs no introduction. It is the seventh piece in G flat major from a cycle titled Humoresques, Op. 101, for piano solo. The original version is played far less frequently than the countless arrangements for a wide variety of instrumental combinations. Its characteristically “hopping” rhythm gave rise to the false legend that Dvořák composed it in a train, being inspired by the rhythm of the rolling wheels. In any case, both audiences and we performers enjoy this Humoresque anytime and anywhere. The works of the Finnish composer Jean Sibelius (1865–1957) encompass large-scale symphonic compositions that contain passages that may strike some listeners too long-winded. His Water Droplets (or Raindrops), however, cannot at all be characterised this way. This was Sibelius’s first work, a little composition that he wrote when he was nine years old. On our CD, it plays the role of an encore at the end of our concert. We wish to thank everyone without whom this CD could not have been made: the recording director Jaroslav Krček for his kind, inspirational collaboration, the recording engineer Karel Soukeník for perfectly handling the technical aspects of the whole recording process, Ondřej Melecký for taking the photos, and last but not least, the publisher Vítězslav Janda for bringing this CD into the world. 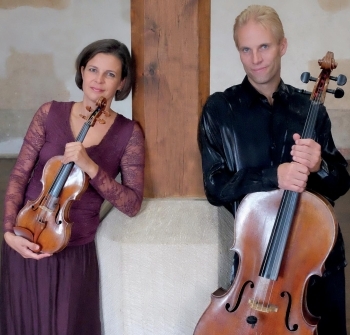 THE CZECH STRING DUO was founded by the violinist Lucie Hůlová and the cellist Martin Sedlák in 1994 while they were studying at the Prague Conservatoire. Since then, they have made many successful appearances both in their own country and at festivals abroad (Switzerland, Spain, Germany, Austria, Greece, Syria, Jordan, Egypt, Russia, Argentina, Mexico). Lucie and Martin are graduates of the Prague Conservatoire and of the Academy of Performing Arts in Prague. As students they participated at many master classes and won a number of awards at international competitions. In 1998, their duo won first prize in the competition for the best performance of a work by Bohuslav Martinů at the International Summer Academy in Semmering, Austria. They have also made several recordings for Czech Radio, and their concerts have been taped by foreign radio networks as well (e.g. ÖRF 1, Radio Nuevo León Mexico et al). The ensemble’s repertoire includes duets ranging from the Baroque era to the present. 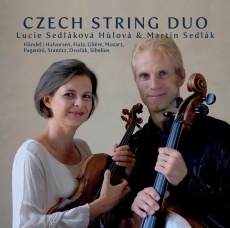 In 2002 the Czech String Duo released its debut CD, for which the performers chose their favourite works by 20th-century composers (Martinů, Honegger, Ravel). In 2019, the publisher Arta Music is issuing a second CD with works by the composers Mozart, Stamitz, Fiala, Paganini, and Glière. 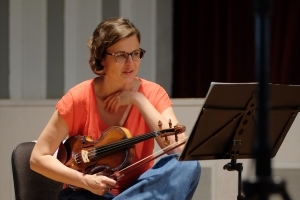 The two artists perform both as soloists and in chamber music. Together with the pianist Veronika Böhmová, they make up a piano trio called the Kinsky Trio Prague. They play in the Praga Camerata chamber orchestra, with which they also make solo appearances. In addition, they collaborate frequently with the violinist Pavel Hůla and the organist Jiřina Dvořáková Marešová. With these ensembles and as soloists, they have given hundreds of concerts on five continents, and they have recorded several CDs. From 2000 to 2004, Lucie and Martin were members of the international UBS Verbier Festival Orchestra, where they had the opportunity of working with the world’s top conductors and soloists. Besides frequent guest appearances at the prestigious Verbier Festival in Switzerland, they have performed with that ensemble on the world’s most famous stages, such as Carnegie Hall in New York, the Musikverein in Vienna, and the Teatro Colón in Buenos Aires. They have also collaborated with a chamber orchestra led by Maxim Vengerov. Recently, both musicians have also been devoting themselves to teaching, and they lead international chamber music courses as tutors. On this recording, Lucie Sedláková Hůlová plays a violin by an Italian master of the latter half of the 1800s, and Martin Sedlák plays a cello made by Otakar František Špidlen in 1928.